SHANGHAI and CRANBURY, N.J., April 19, 2018 /PRNewswire/ -- WuXi AppTec, a leading global pharmaceutical and medical device open-access capability and technology platform company, today announced the opening of its expanded Laboratory Testing Division (LTD) facility in New Jersey. The grand opening event was honored by the presence of state and local officials including State Senator Linda Greenstein. The new facility will enhance WuXi's integrated testing service portfolio enabling drug developers to accelerate their projects from labs to patients. "As a renowned global company in life sciences industry, WuXi AppTec is an essential part of New Jersey's pharmaceutical community. 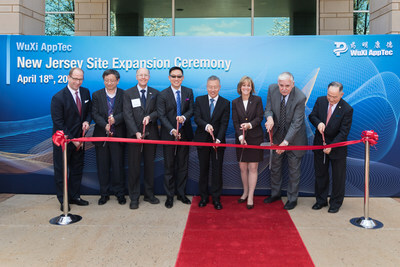 The commitment shown by global companies such as WuXi demonstrates that New Jersey is a good place for science and technology companies to do business," said Mr. Glenn Johnson, Mayor of Cranbury, NJ. The new site will establish a center of excellence for drug development and provide high quality services to the US pharmaceutical and biotech industries. Furthermore, WuXi will recruit extensively from the local talent base, further contributing to economic growth locally. "The Garden State continues to be an important life science hub. This expansion will allow our team to deliver high quality service with faster turnaround times, better leverage the resources and expertise of the local pharmaceutical and biotechnology community, and develop a stronger connection with our customers," said Dr. Jason Liu, SVP of WuXi AppTec and Chief Operating Officer of the LTD.
"We are delighted for this opportunity to better serve our global customers and to support local economic development in New Jersey," said Dr. Ge Li, Chairman and CEO of WuXi AppTec. "We will continue to enhance WuXi's capabilities and capacities to enable our global partners to discover and develop drugs more efficiently and cost effectively ultimately benefitting patients worldwide." WuXi AppTec is a global company headquartered in Shanghai, China. In addition to the New Jersey site, WuXi also has U.S. facilities in Philadelphia (PA), St. Paul (MN), Atlanta (GA), San Diego (CA), Boston (MA) etc. WuXi's continually growing global presence includes Germany, Israel, South Korea, Japan and beyond. WuXi AppTec's Laboratory Testing Division is a comprehensive and integrated testing platform for drug and medical device development. Fully integrated within WuXi AppTec, a world-class CRO with operations in China and the US, the Laboratory Testing Division provides in vivo and in vitro assays from early screening through clinical sample analysis, and medical device testing from development through product lifecycle management. Please visit http://labtesting.wuxiapptec.com/.